Programs for your desktop computer. HackStract v2 is an attempt at improving the original .hack image extractor, written by Jeffrey Riaboy (Dakusan). My primary focus was in getting the program to handle files that contained multiple images, which the original didn't support very well. Also, I determined how the original height and width of the images was stored, so this program doesn't have to offer a "best guess" as the original did. 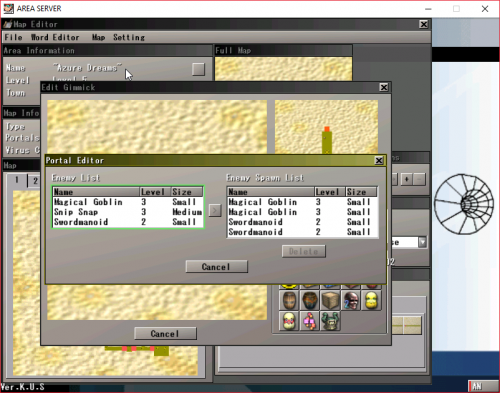 Finally, this program is also able to handle the data file from the GU games, as well as the original games. 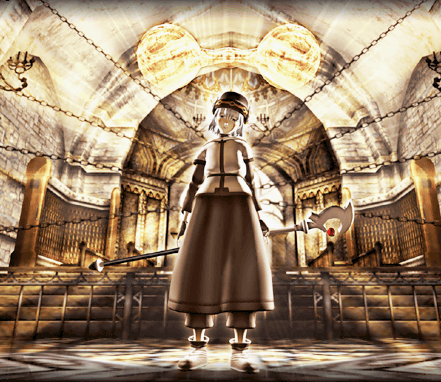 I have tested the program with the data files from .hack//Quarantine, and G.U. Vol 3. It should work without problems on the earlier games from each series. I believe it may also work on other games produced by CC2, but I don't own any myself, so I couldn't test it. As for other PS2 games, try it and see. Locate the appropriate data file from the game disc. DATA.BIN for the original games (Outbreak~Quarantine), DATA.CVM for the GU series. The program will scan the file and locate all the images it contains, there will be a listing at the left of the window. 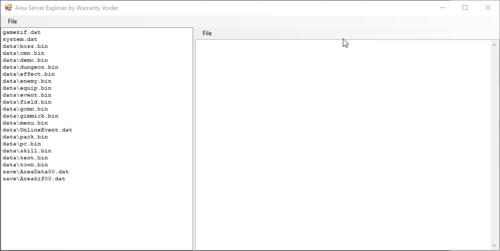 The items with folder icons are files that were contained in the data file. An open folder icon indicates the file that is currently loaded in memory. closed folders indicate items that need to be loaded into memory before they can be extracted or viewed. 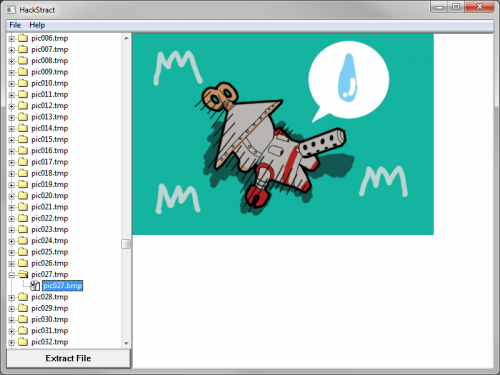 The items with picture icons indicate bitmaps that were found in the indicated folder. Selecting a picture lets you preview the image in the right side of the window. Select any picture or "folder" item on the list, and click the "Extract File" button in the lower left to save a copy of the selected item. If you want to look at a data file from another game, you may close the current data file ("Close" on the File menu), and then open a new data file as before. Some of the images appear blank, or as a solid block of a color. This is because the original images use varying levels of transparency, which Windows Bitmaps ignore. The transparency levels are stored in the color palette (Red, Green, Blue, Alpha), which my program faithfully copies when you extract an image. A good example from the Outbreak and Quarantine data files is xddwal49, which contains several solid black images. They're not actually solid black, but black with varying degrees of transparency, being the black shadows you see on the Phantom of Nine wallpaper before you complete the event. The transparency allows the shadows to be overlaid on top of the background image without producing jagged edges. For Outbreak~Quarantine - the default desktop wallpapers contain strange characters in their file names. This is not a bug, the files were named that way on the game disc. If it bothers you, you have the option of supplying your own name when you save the images. Wallpapers have a large black or white area at the bottom. Also not a bug - the original wallpaper images on the game disc are 512 x 512 pixels. The screen only displays 512 x 384 pixels. To use these images for your own desktop wallpaper, extract the image, then open it in Paint. Go to the Image menu, and select Attributes. Change the height to 384 pixels (this will crop the bottom off). Save (or Save As if you want to preserve the original file), then set that as your wall paper, and select "Stretch" for the position. If you don't have a wide screen monitor, that should look right to you. Thanks go primarily to Jeffrey Riaboy (Dakusan); the source code he supplied with his program gave me enough information to figure out the niggling details of how the images were stored. Thanks also go to www.dothackers.net. Their forums led me to the orignal program I based mine from. And of course, thanks to CC2, Bandai, and all the other folks involved in making all things .hack. Without their awesome artwork, this program would be pretty useless. This software is provided "as-is", with no warantees of any kind. I cannot be held accountable for any damage that occurs from, or while using this program. Copy data.bin (from your .hackCD/data folder) to the directory this program is in. You can directly link to it on your DVD-rom drive if you edit the 1st uncommented line in the WinMain function (programming stuff). The listbox controls what picture is displayed on the screen or saved with the buttons. Space goes to the next valid picture (not really needed anymore since at least 90% of the files show pictures). 1-9 Change the “width” of the picture. The program sometimes inaccurately judges the width (as I did not reverse engineer all the variables). This will be seen as 2 or more almost identical pictures side by side. 5 is the base, 1-4 makes it shrink in 50% intervals, 6-9 makes it grow in 50% intervals. (Example: cw1hsw00_4 should be setting 4). All other keys control the listbox as normal (pageup, pagedown, up, down, letters, end, home, etc) Listbox maintains focus. All files saved with the buttons are saved in the same folder that the program is executing in (where the data.bin is). Bitmaps are saved in palette format (usually 8bit/256 colors), as they are originally stored in that format. This tool allows you to play, convert, and downsample audio files that use some of the more common formats among PS2 games. It can be used to reduce the size of music in DVD rips, replace the music with something else you prefer, or simply to play the music from your favorite games. Please note: It is assumed that the user has a reasonable level of technical knowledge - this tool isn't for newbies. Please *do not* email me questions about how to play/convert a file from a particular game. You're on your own! Using the GUI should be straight-forward. Press the 'Open' button and select the file you wish to use as input. If the file is a known format, then all the details will be automatically filled in. Otherwise, the format will default to Raw (uncompressed or compressed), and you will likely need to set the frequency, channels, and interleave manually. The 'offset' option can be used to step past a certain number of bytes that may exist at the start of the file prior to the audio data. You can use the 'Play' button to test the settings and determine if they are correct. Creating an output file for conversion should be just as easy. Start by selecting the output format, and then give a filename. 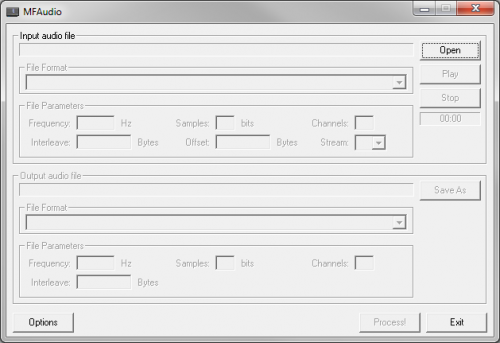 The frequency, channels, and interleave will all default to the same as the input file, so you only need to change them if you intend to downsample. You can also use the utility from the command line (type 'MFAudio /?' for available options). This can be useful if you are creating a rip kit, for example, you can write a batch file that will run this utility to downsample all the music in the game. Here are some settings to play/convert the music from a few different games. I've noted the region I used for testing (PAL, NTSC, NTSC-J). Paradox, Dynamite, Kalisto, Static, Z and the guys at PS2Ownz forums, Zandal, Toshi, PS2foryou.de, Hurricane, Bitmaster, and anyone I missed out! PSX, PS2, Playstation, Playstation2, are registered trademarks of Sony Computer Entertainment, Inc. This product is not sponsored, endorsed, or approved by Sony. Everything here was written personally. It does not contain any copyrighted material (Sony or otherwise). Distribute as much as you like!